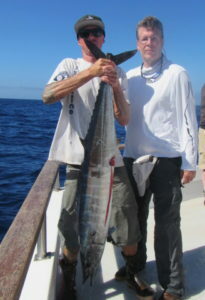 Today, we had great action on wahoo, yellowfin and yellowtail. we will be staying in the same area for tomorrow. Pictured is Lance L. and crewman Hector with a nice yellowfin tuna caught on a chartreuse and white fall flat this afternoon. Wish us luck for tomorrow. ~Captain Shawn and team Searcher. 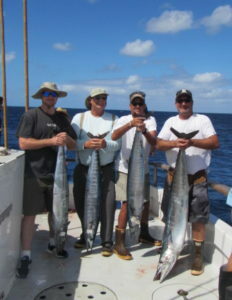 We focused our fishing efforts on wahoo this morning with success. 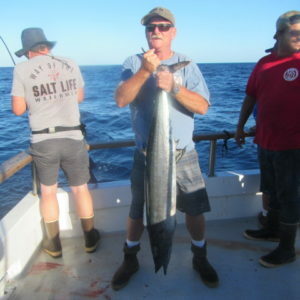 Almost everyone has landed a wahoo. 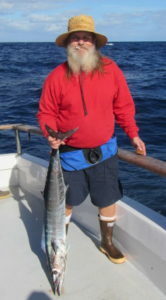 Trolling with live sardines have been the best method for wahoo to today. 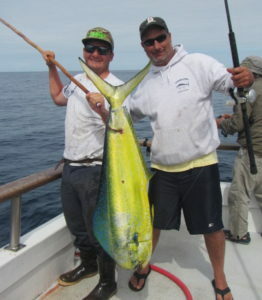 We also have had some very hungry yellowfin tuna that are biting the big Marauder lures as well. We hope to reach our goal of getting everyone a wahoo today and so far it is looking like we might exceed that goal. Here is a group shot from one of some of the action from this morning. Stay hooked more to come. 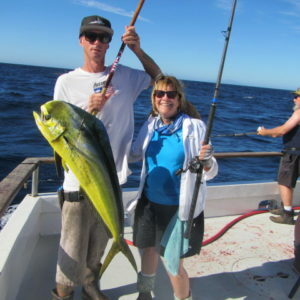 Today we fished along the coast for yellowtail. 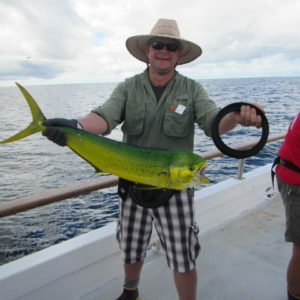 Most of them were caught on fly-lined sardines, and a few were caught on a surface iron. 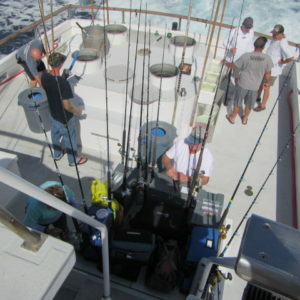 We are heading offshore to look for tuna and dorado, so wish us luck. 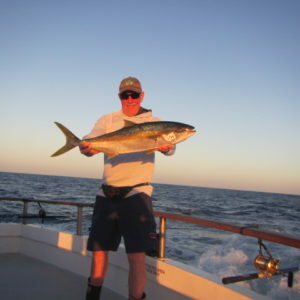 Tommy T. and his yellowtail. 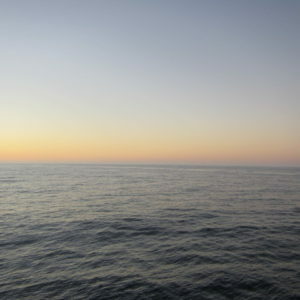 Good evening anglers: Today we set out to find some tuna with not much luck. 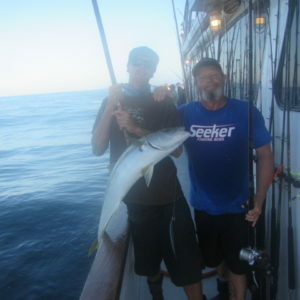 So we changed gears late in the afternoon and fished for yellowtail. 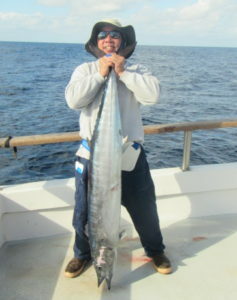 We had had very good fishing on midsize fish. The fish were biting dropper loops and yo yo iron very well. Good times were had by all. It’s beautiful weather— calm seas and sunny skies. We’re heading to a new area tomorrow so wish us luck! 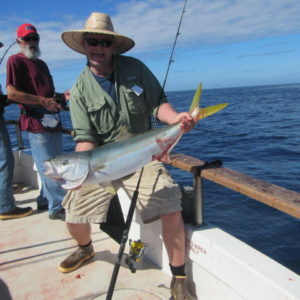 Here’s Joe T with a nice yellowtail. 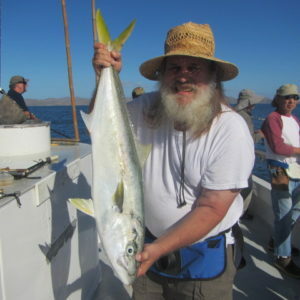 Hello all, Good fishing for yellowtail this morning. The fish are 12 to 20 pounds with a few stand outs that are 25 pounds. 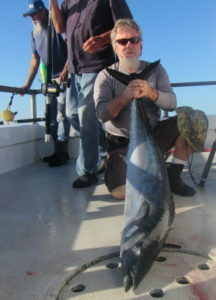 Tackle tip for you is, live sardine on 40 pound line and a 4/0 Owner hook was the method of choice today. A few fish were landed on yo-yo lures, scrambled egg (Tady), chartreuse and white (flat fall) were the good colors. 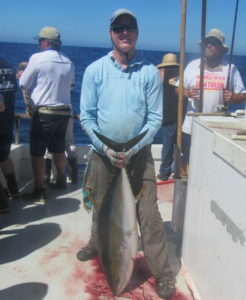 Here is Tanner S.of Bay City Brewery with a nice yellowtail. The weather is awesome, sunny skies and light winds. 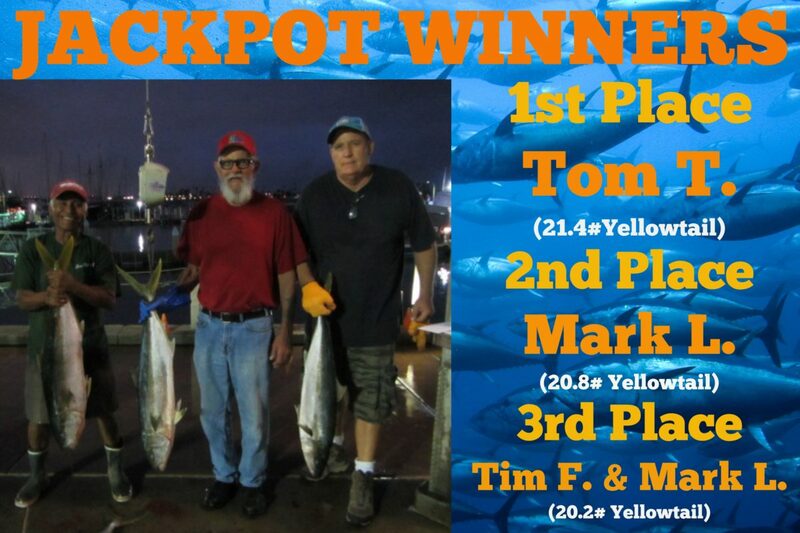 Evening update: Our great fishing continued until 2 pm today. 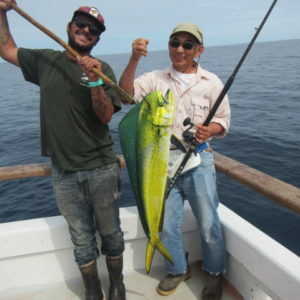 Everyone caught what they needed for yellowtail. 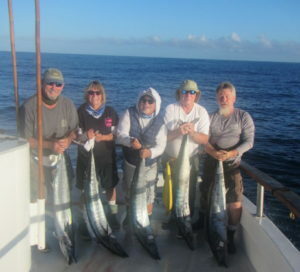 It was one of our best days this year with good-size fish and great weather. Even the crew got in the action! I hooked and handed several fish and Captains Kenny and Mike had some fun doing the same.Towards the end of the bite Ryan landed a fish after hooking a few. Even Chef Roger had a few bites. 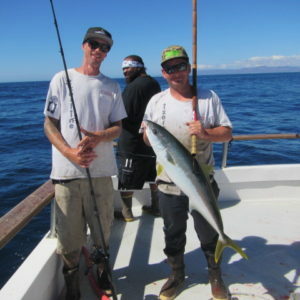 Here is Ryan and Mike with a nice yellowtail. We moved north to try for yellowtail on the coast last night. 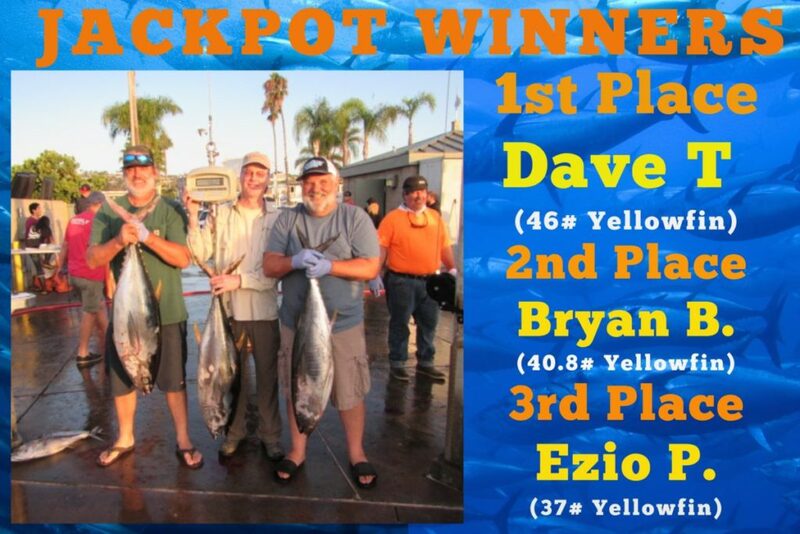 We had good action this morning on yellowtail 15-25 pounds. 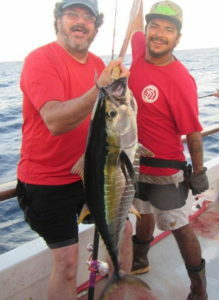 Almost all the fish were landed using live sardines with 40 pound line and a 3/0 J hook. Everyone had a good time with steady action and great weather. Sunny skies and light winds. We are finishing our trip today and will be traveling north and arriving early on Sunday morning. 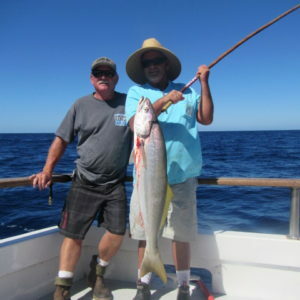 Here is Fred B from Ventura with a nice yellowtail. Fred is the Seeker rep on this trip and did a great job passing on all his knowledge about saltwater fishing and Seeker rods. Thanks to Seeker for all the great swag on this trip and their support this season.